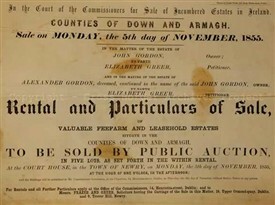 Image shows a typical front cover of a catalogue produced for the disposal of estates offered for sale through the Encumbered Estates Court in 1855. The Encumbered Estates Acts, 1848 and 1849, allowed the sale of Irish estates which had been mortgaged and whose owners, because of the Great Famine, were unable to meet their obligations. It was hoped that English investors would be attracted to buy Irish estates and thereby transform Irish agriculture. Under the 1849 Act an Encumbered Estates Court was established with authority to sell estates on the application of the owner or encumbrancer (one who had a claim on the estate). After the sale, the court distributed the money among the creditors and granted clear title to the new owners. The existing tenants on the estates were unprotected by legislation. Estates were generally bought by speculators. Between 1849 and 1857, there were 3,000 estates totalling 5,000,000 acres, disposed of under the acts. The functions of the court were assumed by the Landed Estates Court in 1853. The Irish Encumbered Estates Court rentals are in bound volumes (and are available for the whole of Ireland). They are divided by county and include as well as rentals - maps of the estate giving tenants’ names and, on occasion, surveys of the estate. They are an under-used source for genealogists interested in the names of tenants of various estates throughout Ireland in the mid-nineteenth century but they are equally of interest for the 18 th century as there are numerous references to leases that were taken out in the 1700s. A small estate at Cuslough, parish of Ballinrobe, barony of Kilmaine, county Mayo, was held by Richard Livesay in the mid 19th century. This property was part of Lord Tyrawley's estate, later owned by the Knoxes of Creagh. Richard Livesay advertised the sale of his lease of 358 acres at Cushlough in the Landed Estates' Court in 1866. Edward Livesay was advertising the lands of Ballyveane, parish and barony of Ross, county Galway, for sale in the Encumbered Estates' Court in March 1855. The 680 acres of Ballyveane were held on a lease from Denis Daly of Dunsandle to Gregory Cuff of Creagh dated 12 Oct 1790. Another 1970 acres at Kilbride in the barony of Ross belonging to the Livesays was advertised for sale on 20 May 1862. This property was held under a fee farm grant from the Provost of Trinity College, Dublin to Charles J. Lynch of Petersburg. Edward and Richard Livesay were both described as deceased in the rental schedule. The Livesays were also selling over 700 acres in county Meath in 1862. Charles E. Livesay of Cuslough, Ballinrobe, is recorded as owner of 1970 acres in county Galway in the 1870s. A Marcella Livesay owned over a thousand acres in the parish of Boyounagh, barony of Ballymoe, county Galway, at the time of Griffith's Valuation. 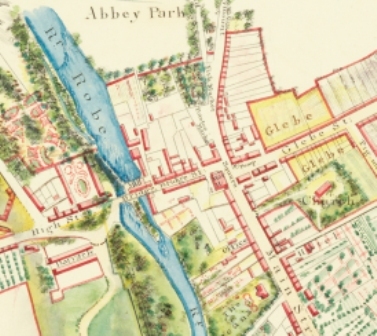 Robert Tighe was a prosperous merchant of Ballinrobe , barony of Kilmainemore, County Mayo, in the mid 19th century who bought lands for sale in the Encumbered Estates' Court. At the time of Griffith's Valuation Robert Tighe held 3 townlands in the parish of Kilmainemore, barony of Kilmaine, county Mayo, previously part of the estate of Arthur Browne of Glencorrib, parish of Shrule and one townland in parish of Crossboyne, barony of Clanmorris, bought from the Blakes of Merlin Park. Robert Tighe held a townland in the parish of Templetogher, barony of Ballymoe, county Galway, in the mid 1850s. In 1863 he bought The Heath from the Blakes. His first wife was Catherine daughter of Thomas Kelly and their eldest son Thomas was Member of Parliament for county Mayo in 1874 and married in 1875 Marie Antionette Dolphin of Danesfort, county Galway. By 1876 members of the Tighe family owned more than 2,000 acres in county Mayo and 1,025 acres in county Galway. Part of the Tighe's county Mayo estate was sold to the Congested Districts' Board in May 1906. 593 acres belonging to Thomas Tighe in county Galway were vested in the Congested Districts' Board on 26 April 1907. Robert Dolphin Tighe is recorded as the owner of over 340 acres of untenanted demesne land and a mansion house valued at £15 at Lisduff, Loughrea, in 1906. An index to the Encumbered Estates Court rentals is also available at Public Records Office, Belfast.